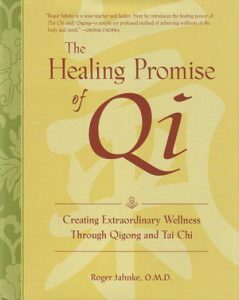 Qi cultivation is the balancing and harmonizing of qi in the body. It is like filling the reservoir of our body with good energy upon which the body can draw to maintain health and vitality. It begins with the intention of building the qi. It is amazing how our intentions set into motion everything that follows. If I choose to practice qigong, I have set in motion an energy throughout my body that begins to prepare the way for the qigong to take effect. There are ten phases of qi cultivation. The first is the awareness of qi. I think back to my days of studying martial arts and recognizing the difference between the various sifus I studied under. Some were very strong, violent and aggressive. Some were more meek and seemed to lack confidence in what they taught. Then there were those who were confident, yet not ones who had to prove their abilities. There was a quiet, calm, yet powerfulness to their presence. One in particular always stood out. He moved with a gracefulness and powerfulness that was unlike anything I had seen in any of the other sifus I studied with. His stances were more precise. His movements were cleaner and his strikes always had power that came from someplace within. I knew something was different. Only later did I learn he was a master in Qigong. Only later did I realize what made him so different. It was in that discovery that my eyes were opened to qi. The second phase is to gather qi. Or maybe, more accurately stated, the second phase is the awareness of and intent to gather qi. We are gathering qi from the air we breathe and the food we eat. We gather qi through the chakras spontaneously. However, this phase is about being intentional about gathering qi. The third phase is the circulating of qi. This phase is focused on the movement of qi through the body. Stagnant qi is as bad as being deficient in qi. We need the qi to be circulating through the body, bringing the life source energy to work throughout the body. If I understand correctly, the process is mostly getting out of the way or not resisting the circulation. We do this through internal quiescent qigong or what is known as sitting qigong that allows us to get out of the way, but we must also do it through active or dynamic qigong. The fourth phase is to purify qi. Our bodies naturally filter qi and expel that which is beyond our need and may become toxic to us. Jahnke explains this happens through greater intention at the point he describes the HeartMind. This is where he describes the body meets the non-body aspects of our self. Maybe this non-body is what I know as the aura. As we focus our intention on this place, we pass through a gateway in our qigong training, allowing us to purify our qi through movement, breath and sound. Each of our organs has an element and a sound that are associated with it. It is here where we make intentional efforts to release things that affect our qi, through forgiveness and other forms of letting go of emotions and energies that are harmful to us. I would love to consider how sound baths might interact with this phase. I find music often impacts me at spiritual levels that I can’t readily explain. Phase five is the directing of qi in times of need. In a healthy state, this is not as necessary. However, when we suffer from stagnation qi or have suffered from qi deficiency, it may have led to challenges in a particular area of the body. Of course, other things may impact the qi in a particular area; emotional stress, injury, etc. It is in these times we can choose to direct qi to those areas. Our HeartMind is the commander of our qi. Through focused intention and will, the guiding of qi through breath, massage, and movement allow us to direct qi to specific areas. We can also use acupuncture, herbs, oils, magnets and hot coins. I think fire cupping is another method that would work here. Phase six is conserving qi. The body has the ability to store the qi it needs. This phase is the focus on minimizing those things that deplete us of the qi we need and the continuous process of replenishing our qi so that we are always maintaining the qi levels in our body needed for optimal life. This phase is about discipline, focus and intention. We move in this phase from focus on posture, movement, breath, etc. to focus on behavior, personality and character. It is in this phase, we shift from the body to the whole being as the center of our focus. In my comment above, I mentioned aura. I believe it is in this phase, we are working to strengthen our aura, who we are and who others experience us as. Phase seven, the storing of qi. Our bodies store qi in special areas of the body. These areas include the Central Tai Chi Channel, the twelve organ channels, the Eight Extraordinary Channels, along with our organs and dantian. Marrow throughout the body also holds qi. According to Jahnke, the mastering of the HeartMind is required to comprehend and work with the Heaven Qigong that is required for this phase of storing, as well as the phases of transforming and dissolving. Phase eight is transforming qi. In this phase we discover our eternal state. We become aware of our place within the oneness of the universe. We are transforming qi to shen and transforming ourselves from self into an existence that is beyond our body. Phase nine is dissolving in qi. In this phase we have so cultivated qi that we have revealed our very essence. As I read Jahnke’s explanation, I understood it as we become so aware of our inner divine self that we see all of life from this inner self. Up until this phase, we have sought to connect with this inner Spirit. At this phase, we recognize this inner Spirit is who we really are. We reach a point of awareness of our true nature that allows us to move forward in life from this awareness. We no longer need the illusions of ourselves we have clung to for security. We see, understand, and embrace our truest self. Phase ten is transmitting qi. Until this phase, we have been focused primarily on ourselves. We have discovered qi and the effects it has upon our lives. We have then discovered that our self is something more than we knew before. We move from a physical awareness of our self and qi to an awareness of our inner Spirit and our true self. It is at this phase that we recognize our part in the universe. It is at phase ten we recognize that our working with qi is in concert with all others working with qi. It is at this phase we begin to recognize the impact we have on the world around us through our practice and the impact we can have with our focused intention. Keith is a conduit of compassion and grace, serving people of all faith traditions and no traditions with an understanding that we all are interconnected and find the source of our interconnectedness in different ways. Keith has an M.A. in Ministry, Leadership & Service from Claremont School of Theology, is a Certified Reiki Master in the Usui System of Natural Healing. He is also a Certified Public Bookkeeper, a Certified QuickBooks Advisor. Keith has a background of serving the Church as the Executive Associate Conference Minister for the United Church of Christ in Southern California and Nevada, as well as, over twelve years in retail and sales. He has served as a volunteer in many organizations, including Angel Interfaith Network, Disciples Seminary Foundation and Pilgrim Place. While Keith remains grounded through his work in administration and finance, Keith has also been called to a unique ministry of healing and spiritual direction, utilizing reiki, pastoral presence and care, multi-religious spiritual practices, and holding space for others to connect with the Divine and discover their own destiny and calling. Keith’s soul journey toward spiritual enlightenment involves blazing new trails as he learns to master the lessons of life brought by the Universe. Intimate relating, skillful management of shared resources, and profound “death-rebirth” transformations are the journey he has been upon for decades. Keith is gifted with deep insightful intuition and dedication, building upon his intrinsic inclinations toward transformative healing, making him a natural agent of change. The transformation and flux of Keith’s self-identity and personal resources have been such a natural skill and life theme that many of his personal life experiences have afforded him wisdom in these areas regarding how to successfully cope and creatively navigate through such transitions. Keith has a naturally ability to work powerfully with channeled energy. He is a natural teacher and sage, strongly motivated by a calling to share his natural wisdom and his many years of collected practical and spiritual insights with those who would benefit. Keith’s purpose as a transformative, spiritual healer is also partly realized through his work as a consultant and coach. Rounding out Keith’s natural skill as a transformative energy worker and insightful consultant, are Keith’s nurturing empathy, love and harmonious mediation into his work. Keith has walked the path of the spiritual seeker aimed toward him finally assuming his inevitable role as teacher, counselor, and transformative healer. Keith has a wealth of experience and gifts to offer the world in the unique signature only he can. Match Numbers * Time limit is exhausted. Please reload the CAPTCHA. Yes, I would like to receive emails from Chi Ki Transformation. Sign me up!